Stand-up comics who do theater or arena shows like to test out material in the place where they started: comedy clubs. They’ll often make surprise appearances, sometimes with a notebook in hand. It gives them a way to see if a joke they think is funny gets any reaction from a crowd before taking it before a bigger audience or a TV special. 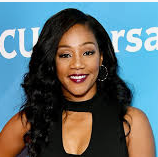 Tiffany Haddish, the rising film star, is shooting a comedy with Rose Byrne called “Limited Partners” in metro Atlanta and has been stopping by Midtown’s Laughing Skull Lounge regularly when she has a spare moment or two. She is prepping for a tour that begins later this month, mostly on the West Coast.